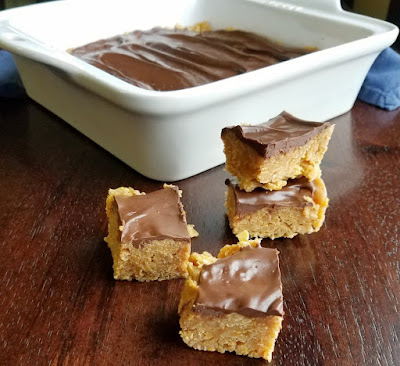 If a quick and easy chocolate peanut butter treat is what you meed, these corn flake bars are just the thing. They are the perfect mix of crunchy, chewy and delicious. You are just a few minutes and a handful of ingredients away from a delicious sweet treat. 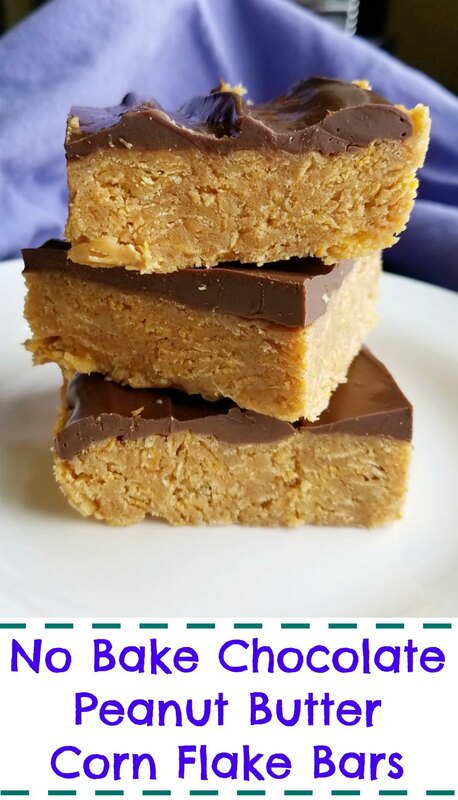 The peanut butter layer is sweet and chewy with the crunch of corn flakes throughout. Of course a layer of chocolate on top brings it all together. These no bake treats will become your favorite quick treat! If you have a saucepan, a spoon and a few pantry staples, you are well on your way to a fabulous treat. 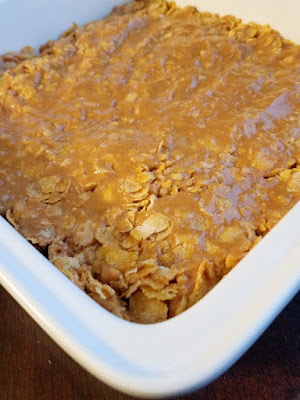 Just melt together some peanut butter goodness and stir in plenty of corn flakes. Then press that delicious mixture into a greased pan. Go ahead and give it a good press, that is what is going to hold it all together as it sets. Then melt together some chocolate and peanut butter and spread it over the top. The peanut butter not only drives home the flavor combo, but keeps the set chocolate softer. 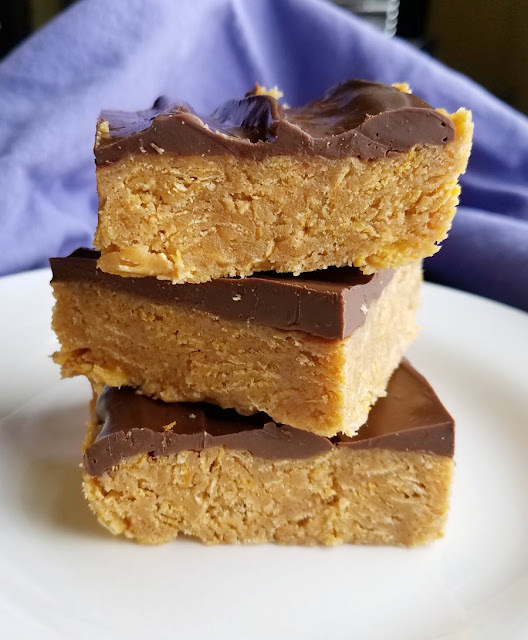 So as you take a bite, you get that creamy chocolate that gives way to the chewy crunch of the peanut butter and corn flake layer. They are so quick and easy to make, you will want to do it all of the time. The would be great after school snacks or perfect for drop in guests you weren't expecting. They are always just a few minutes away and a happy surprise to those they are served to. 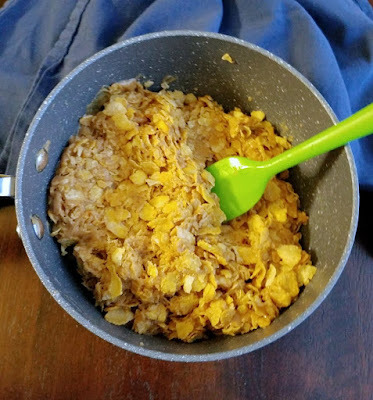 Go ahead and crunch up the corn flakes a bit while you are stirring, you don't have to be gentle and keep them whole. 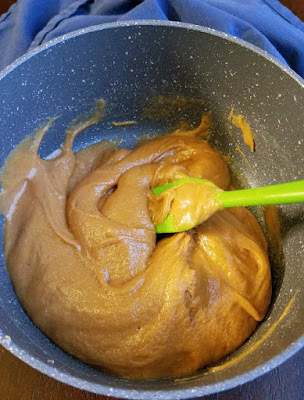 Give the peanut butter mixture a good smash down when you transfer it to the pan. That is what is going to hold them together when it's time to cut and serve them. Be careful not to overcook the chocolate chips when you are melting them. Give them a good stir between each trip to the microwave and stop as soon as it stirs smooth. It never hurts to have some quick and easy treats like this up your sleeve. What are your favorite simple treats to make? Grease an 8" square pan and set aside. In a medium to large sauce pan, cook the peanut butter, corn syrup and sugar over medium low heat until it's warm and gooey. The sugar should be dissolved into the mixture and not grainy. Remove from heat and stir in the corn flakes, there's no need to be gentle or try not to break them. Press peanut butter corn flake mixture into pan. Apply some pressure to make it all stick together. In a small bowl, combine the chocolate chips and remaining peanut butter. Microwave for 30 seconds, then stir. Continue to microwave in 15 second bursts until you are able to stir the mixture smooth. Spread over peanut butter layer. Allow to set, you can hasten the process by putting it in the refrigerator. I love the idea of the cornflakes. I bet the texture is so great! 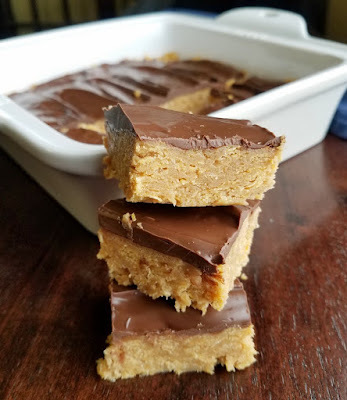 Living in Iowa our Scotcheroos are always make with rice krispies but I love it when someone rebels against tradition and uses corn flakes. I can taste them now! I used to get these at a cafe when I lived in Minnesota, so haven't had them in years! I need some corn flakes now! Cornflakes - interesting. I love desserts made with cereal. Thank you for sharing. They are extra good when they are this easy. You'll have to give them a go!